Yunnan is very cultural diversify when they have 26 out of 55 ethnic minorities in just one province. It was really amazing and I am truly glad that I had the opportunity to travel most of the famous cities in Yunnan. It started from Kunming - Shilin (Yi Tribe) - Dali (Bai Tribe) - Lugu Lake (Mosuo Tribe) - Lijiang (Naxi Tribe) - Shangri-la (Tibetan Tribe) - Xishuangbanna (Dai Tribe). Just six out of 26 indigenous groups that I have visited. I wish could be more. So I will share with you my itinerary and the cost which I paid as of date. Prices may change so please check the accurate fee at the time you read this post. Thank you. 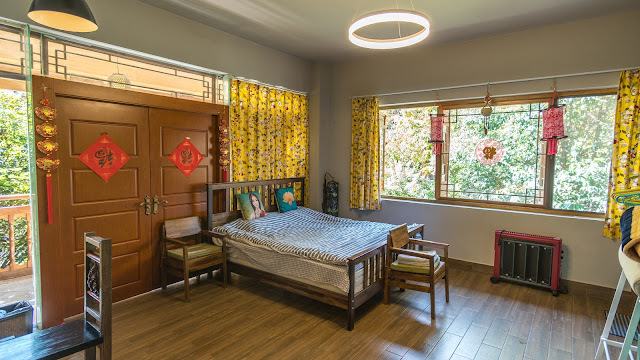 This is the Kunming Shilin Home Inn Hostel where we stay and it really feels like home where the innkeeper was very friendly and nice to us. The hotel room cost us RM100/night which includes breakfast. For your information, the Shilin walking street is just newly built as we were there. I believe there will be things to see and go around after a year from now. Shilin Stone Forest must visit at all cost as the scenery is breathtaking. Jiuxiang Scenic Area can be skipped if you do not want to stay another night at Shilin. 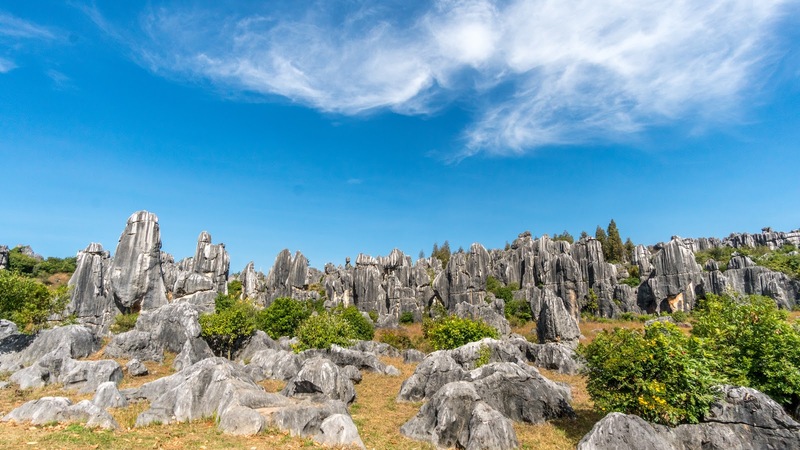 So you can travel back to Kunming after your visit at Shilin Stone Forest. 12.00pm: Arrived at Kunming and taking city bus to Yunnan Minorities Village. The journey took about 1 hour and the fare is just CNY3. 1.00pm: Check in at a Airbnb homestay nearby Yunnan Minorities Village. 2.00pm: Visit Yunnan Minorities Village which is just less than 5 minutes walking from our hotel. The entrance fee was CNY90 and we rent a quadricycle with 2 seats for CNY100. 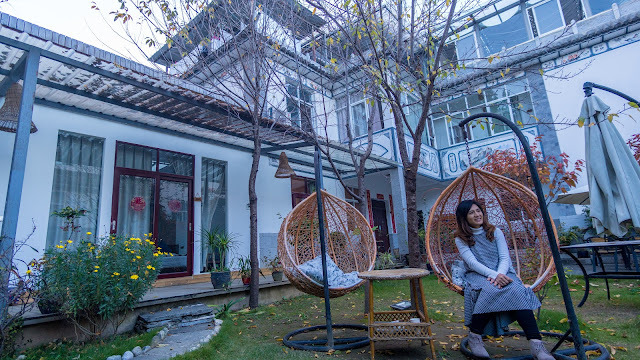 Airbnb in China is not so popular yet especially in the less developed area. So there are not many choices at Yunnan province. This is the most expensive room with have stayed so far throughout our whole trip. One night is about RM280. The heater was unable to warm the whole room and that's the only cons. 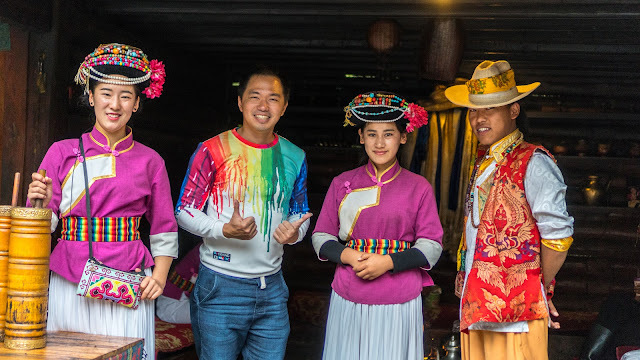 Yunnan Minorities Village is a must visit tourist spot and it should be the first stop you should visit to understand all the ethnic tribes in Yunnan province. The people there are originally from their own tribe and they are very friendly and willing to share about their people, culture and their language. You need one whole day if you are really going to communicate with every single one of the tribe there. 9.40am: Taking the earliest train to Dali Train Station which takes about 6 hours to reach. I choose a hard sleeper couch which costs me starts from CNY97.50 depend on which level you are sleeping on. The top is the cheapest. As a foreigner, you cannot book your train ticket online and buy from their ticketing machine. 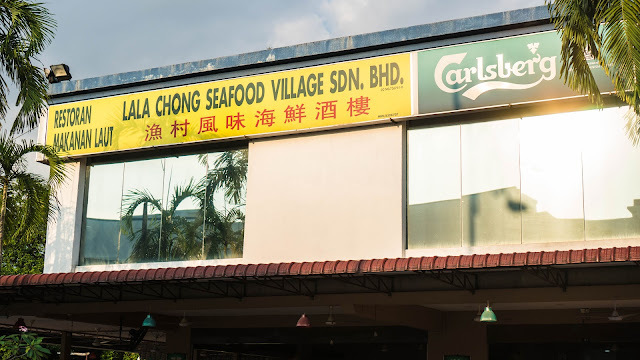 You have to queue up at their counter by yourself with your own passport. There is a service which will help you to buy the ticket in advance and send to the hotel you are going to stay. The price is almost double the price of the ticket itself. 3.40pm: Arrived at Dali Train Station but we have to take a bus no.8 to the last stop which is the Dali Ancient City. The journey time is 40 minutes and the fare is CNY10. 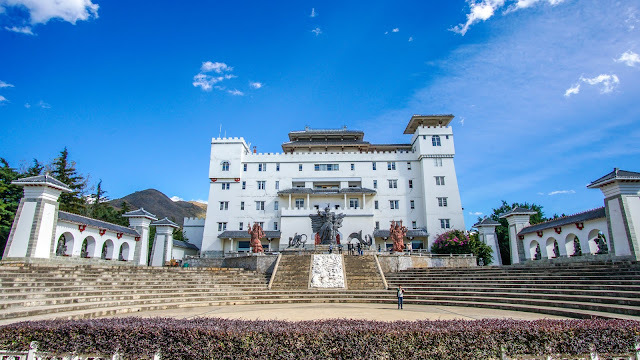 Once you have reached there, you need to pay CNY30 tourist fee for entering Dali Ancient City. 5.00pm: Check in Dali Five Elements Hotel. The Dali Ancient City is just opposite of my hotel. 3.00pm: Going back to Dali Ancient City using the road along the Erhai Lake. To be honest, this day nothing fruitful has been done and could be done better if we decided to rent a bike and go to Shuanglang Town to overnight while charging the bike overnight and travel back to Dali Ancient City the next day. So in the end, we signed up for a 2 days local tour package instead for CNY280. It is dirt cheap especially it is included all entrance fee, lunch and transportation. The cons are this is a shopping tour where they will take you to buy jade and silver and there is no tour guide to travel with you to explain about the tour. 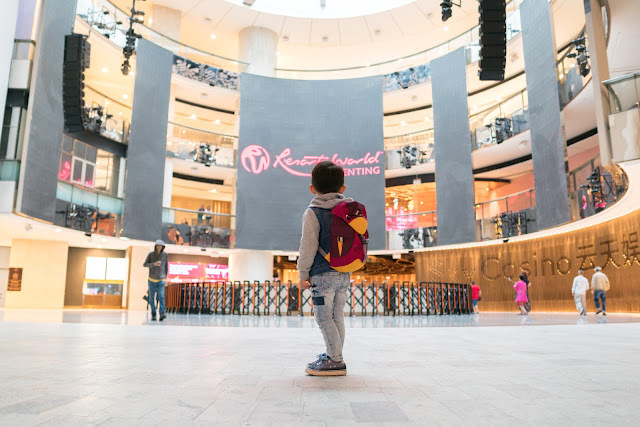 The tour guide is there to say all the nasty words to make you feel guilty so you will start shopping. If your face is thick enough, just ignore and doze off. 7.00am: Pick up by the tour agency and visit Butterfly Spring. 11.00am: Had our lunch and depart to take the cruise tour on Erhai Lake. 5.00pm: Finish the tour and send us back to our hotel or Dali Ancient City. 8.00am: Pickup by the tour agency and bring us to the largest jade shopping mall. It is really huge and you can witness yourself how a stone gambling is like. You buy a stone which you think there is a jade in it. If there is, the jade is all yours. Otherwise, you can keep that stone to yourself maybe decorate it at your lawn. 11.00am: Lunch and bring us to buy silver. Basically the whole second day is about shopping. You can choose to skip their useless second day though. 3.00pm: To Cangshan Mountain. I thought is the Ximatan Cableways but it was the Zhonghe cableways which is just halfway of the mountain. The whole tour package is a waste of time but not waste of money as I have calculated it that I might use more than CNY280 if I do all the itinerary myself. 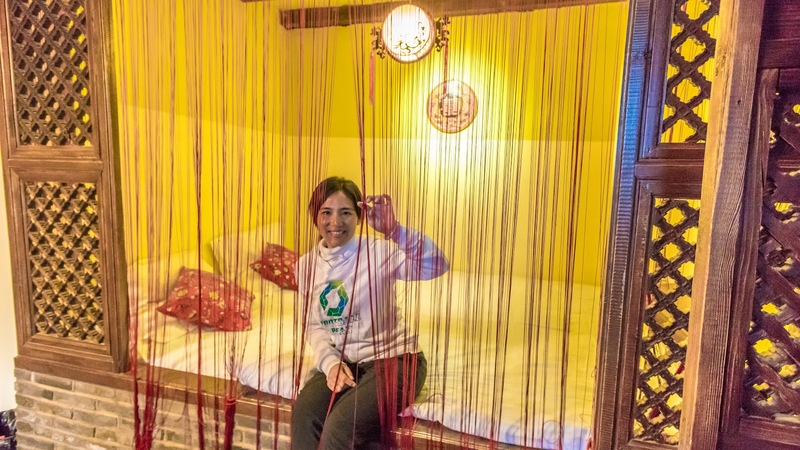 Dali Five Elements Hostel is quite a decent stay which just cost CNY90/night. It is really cheap, comfortable and clean room. Don't forget to try Zhaotong Apple whenever you are at Yunnan. 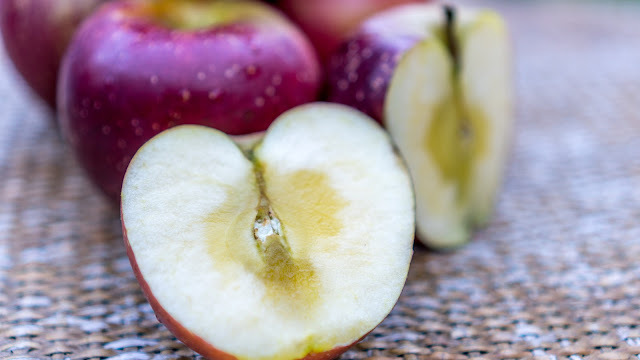 It is one of the sweetest apple by far. It is seasonal to have "sugar heart" at the center as you can see on the picture above. The more sugar heart it is, the sweeter the apple. This is the Dali Ancient City where I had most of my food and night activities here. The Three Pagodas of Chongsheng Temple has always been a dilemma for the tourists in either to visit or not because of the price but still would like to witness the 1600 years old structure. My personal view is optional. 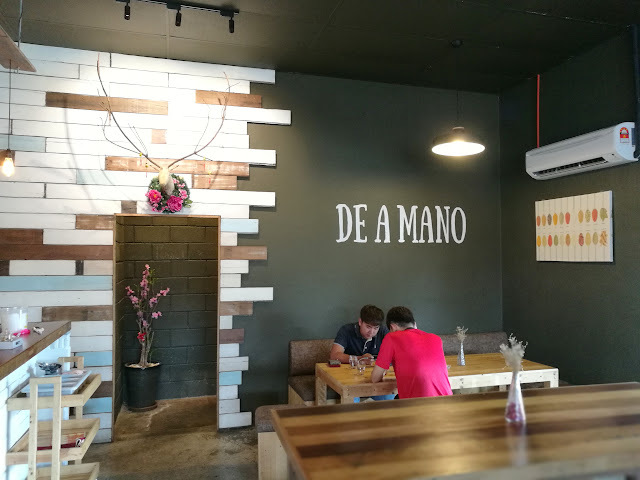 Leave it to the last day or whenever you feel you have extra time and nothing else better to do since it is not far from the Dali Ancient City. As for Butterfly Spring of Dali, you really can just skip it. It is not worth your time and money. This is the Nanzhao Folk Island which is at the opposite of Dali Ancient City. You either go on a cruise package or take a lake tour package. You need to pay CNY50 per pax if you are travelling to the island by your own. 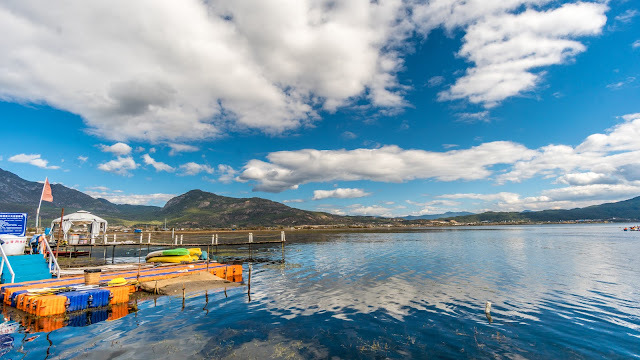 It is worth to check out the island to understand the Kingdom of Dali which was once a great mighty kingdom. If time permits you, take an effort to stay a night at Shuanglang Town. I can guarantee you will receive an unexpected reward. 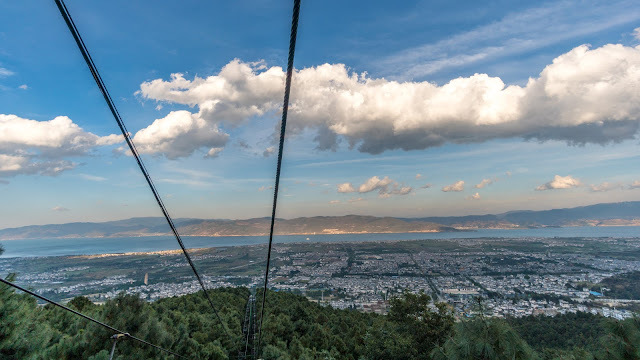 Cangshan Mountain is worth going only if you are taking the Ximatan Cableway. Yes, there are three cableways whereby two of them are not reaching to the top of the mountain. It is just heading to a temple only. 8.00am: There is no direct bus from Dali to Lugu Lake so we need to take a bus to Lijiang first which cost us at CNY70/pax. We bought our ticket from the tour agency at Dali Ancient City. It is somehow much cheaper than buying the ticket from the Dali Bus Station. They provide hotel pick up too. 11.00am: Reached Lijiang for transit but it was too late as the 3.00pm bus was full. They has 3 time slots but the other 2 time slots was at 9.00am and 10.00pm. My only option left is to go to Ninglang County which cost me CNY70 for another transit. 5.00pm: The road to Ninglang was horrendous. It was bumpy, curvy and narrow road to the destination. Landslide does happened. Once reached there, we need to catch a blue color private car for CNY100/pax which includes the entrance fee of Lugu Lake @CNY100/pax too. We need to wait until the car is fully occupied before it starts its journey to Lugu Lake. 8.00pm: It just take an hour from Ninglang to reach. We had a simple stay overnight before we decide a hotel to stay for the rest of our 2 nights. 9.00am: We had our breakfast and start looking for room to stay. There are 3 areas if you are from Yunnan province which are Xialuoshui, Lige and Puleluo. These villages are at the Yunnan pronvince and it is easier for you to get back to Lijiang if Lijiang is your next stop. 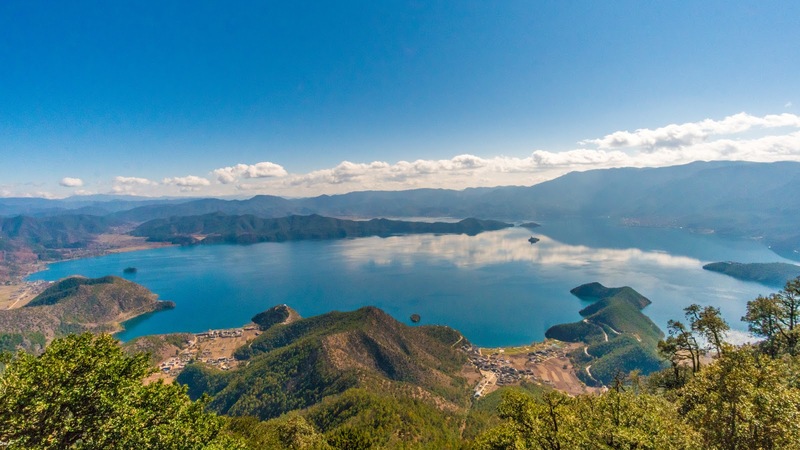 There are more options at Sichuan province as 2/3 of Lugu Lake belongs to Sichuan province. 12.00pm: We finally decided our stay at Xialuoshui it is because we do not want to waste any more time and money as the transfer from one village to anther village cost us CNY20/pax. 2.00pm: After a rest and lunch, we finally started our half day tour towards the east of Lugu Lake where we will cross the Sichuan border. We rent a bicycle at CNY20/pax. 3.00pm: We had our first boating to experience to Liwubi Island for CNY80/pax including circling around the island. 5.30pm: We had our second boating experience to The Inn, Princess Island and Caohai lake for CNY120/pax. NOTE: My personal advice is just go to Liwubi Island and Xiwa'e Island will be enough because other places you will see the same scenery. 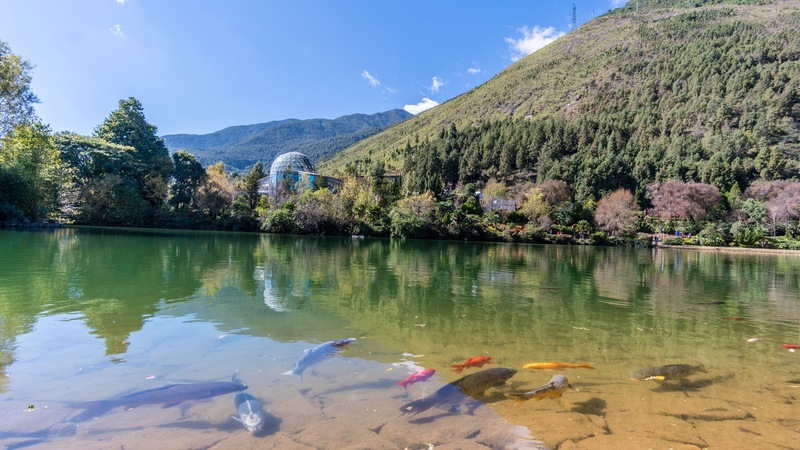 Seasonally, you should go to Caohai Lake. To see a large piece of green grass shooting up from the lake. It is a great view especially your boat is passing by it. 9.00am: Rent a bicycle at CNY20 and travel to the west side of the lake. First stop is to Lige. 1.00pm: Proceed to the next stop at Gemu Holy Mountain. The chairlift cost CNY110/pax and we ride a Toboggan which cost us CNY70/pax. Travel back to where we stay. 5.00pm: Reach our hotel and call it a day. It was a tough bicycle ride. You don't have to book early for the hotel if you are not travelling at the peak season. The peak season is their national public holiday. You just have to choose an area you wish to stay at and you start to search the hotel one by one. You can view the hotel too. Most of them will have room. The room price started from CNY100. The room I stayed cost me CNY250/night with a lake view. The room is spacious and I really love it. To get the best view of the whole Lugu Lake, you just have to take the chairlift to the Gemu Holy Mountain. It is expensive but it is worth it. 2.00pm: Reached Lijiang and we have to pay CNY10/pax to get to Lijiang Old Town. It is a transit van where they will wait until the whole van is occupied before the journey started. 2.30pm: Arrived at our hotel which is located inside the Lijiang Old Town. Had a rest before we started our tour around Lijiang Old Town. 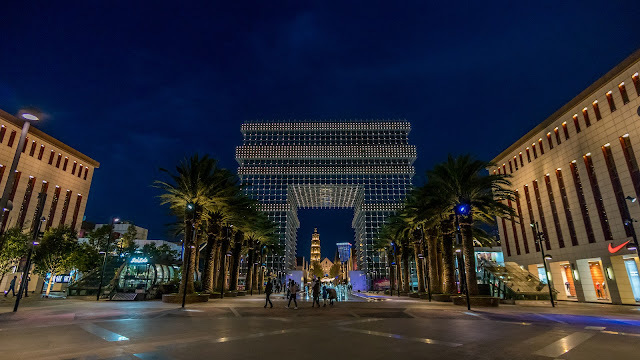 We took the opportunity to survey the local tour package to nearby attractions. 8.00am: Depart to Lashi Lake. 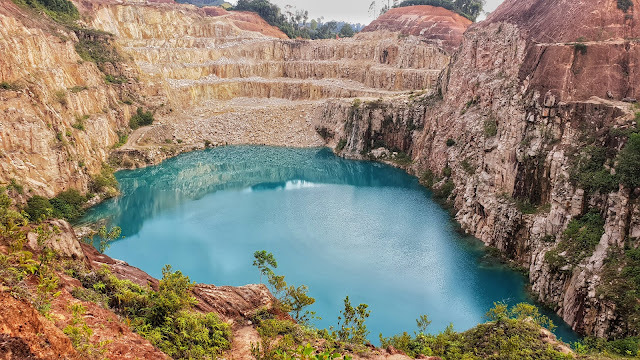 Signed up with a local tour which cost me CNY200/pax inclusive of 1 hour of horse riding, 1 hour of canoeing, lunch, transportation and all entrance fee. 9.00am: Just 1 hour journey to Lashi Lake and had a very bad horse riding experience. The horse is so small like a donkey, the stench smell of the horse poop along the way is really unpleasant, the ride is not comfortable too which you wish to get off after 30 minutes ride, you can't even take a photo because they are worried you might fall off from the horse and many more small things which is not recommended to take the horse ride. 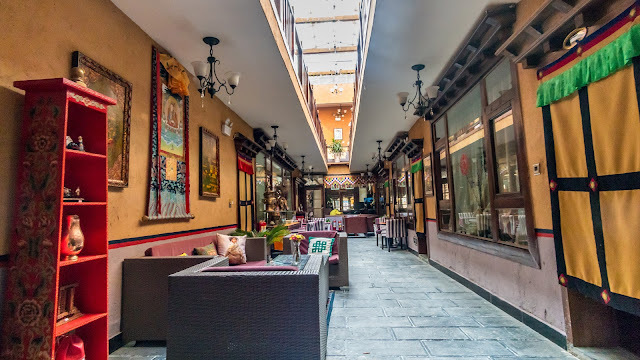 12.00pm: Lunch time and start taking pictures around the well decorated restaurants. Our activity ends after we finished our canoeing. We can opt to go back anytime we want after the lunch. 6.00pm: Return to Lijiang Old Town and start our night walk again for the second night. 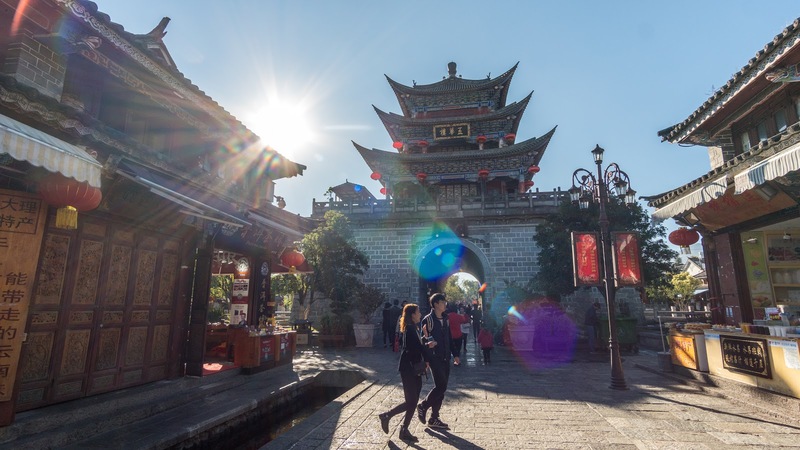 The Lijiang Old Town is like a maze. It is really big but somehow you will walk back to the same place. 9.00am: The temperature is very cold once we get to the bottom of the mountain especially in the early of the morning. Luckily we are given an extra winter jacket and an oxygen tank which is included in the package. Lunch is included too. 10.00am: Blue Moon Valley is our first stop. We had a wonderful experience here at this amazing valley. We took a lot of great picture here but we are limited to 90 minutes of travel time at this area. 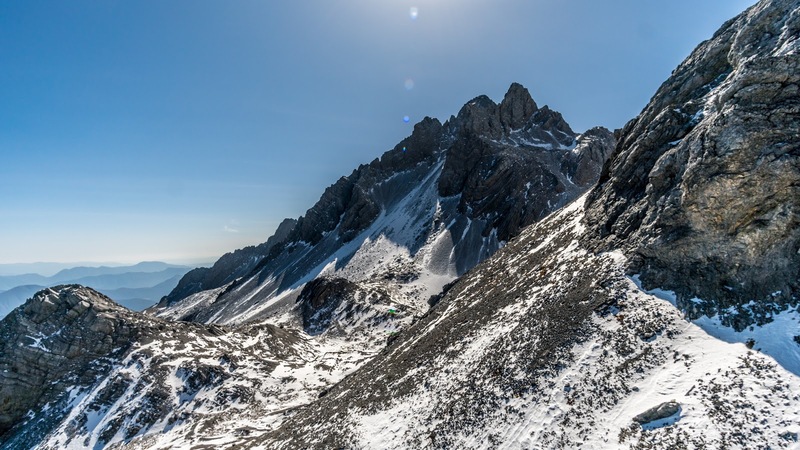 11.30am: Depart for lunch and proceed to the cable car station which lead us to the top of the Jade Dragon Snow Mountain. Please make sure your tour package is to the top of the mountain and not somewhere else at the middle of the mountain as there are alternative travel to other part of the mountain which is not the peak. 3.00pm: We are given a time limit to come back by 3.00pm. 4.00pm: Depart back to Lijiang Old Town and we had a short trip to Shuhe Ancient Town. 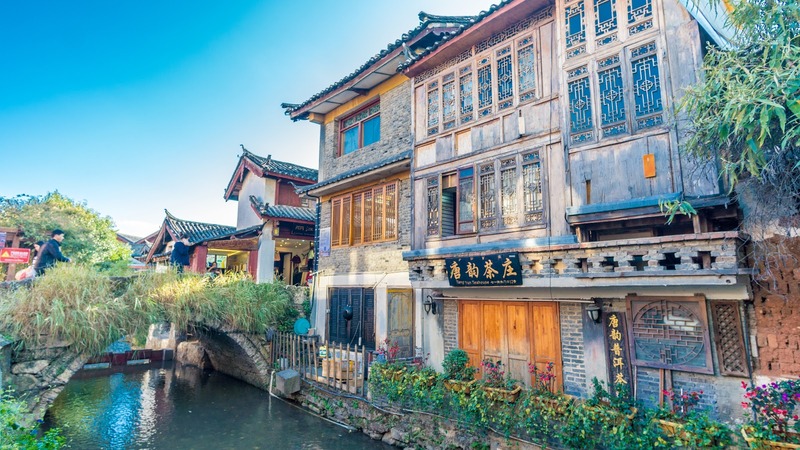 It is a small town which is not worth the trip as it is almost the same like Lijiang Old Town. 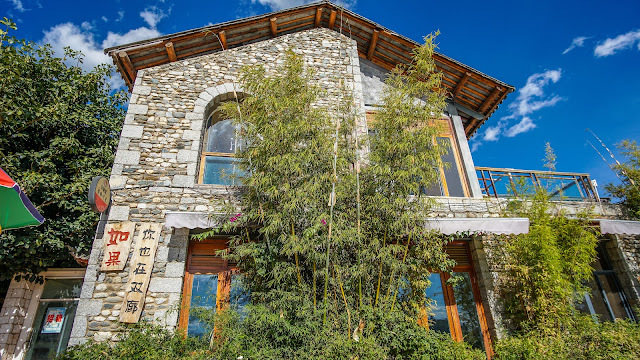 The hotel options inside Lijiang Old Town is a lot and there are many vacancies. But dragging your bag one hotel to another is a bad idea too. So it is best you select some hotels you wish to check out and then start bargain for a better price. I believe you can get a cheaper price than you see at Agoda. This hotel which is decorated in old Chinese style bedroom just cost us CNY150 per night. It was a pretty comfortable, spacious and excellent hotel to stay for more than one day. Lijiang Old Town is like a huge maze. You might turn into the same street again without really complete checking out all other streets. I can't even know if I have completed my tour all around this place. Nonetheless, be amazed with the buildings and structures here. It is much more hectic than Dali Ancient City but it is for a reason. You will find out yourself. Shuhe Ancient City is another ancient city at Lijiang. 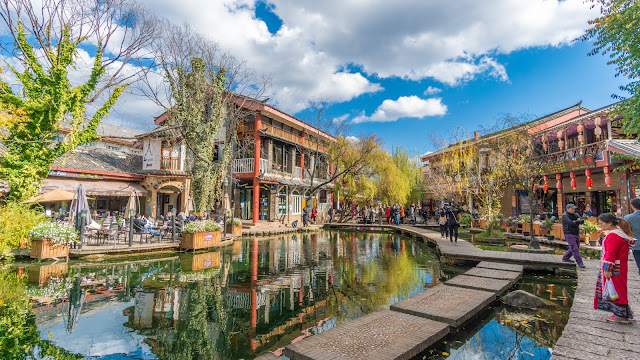 Personally I wouldn't advice to take a trip to here because it is about the same thing you will see at Lijiang Old Town. The only difference is this one very street where the river will flow across the middle of the street. Please visit Lijiang first before you visit Lugu Lake. After I have visited Lugu Lake, all other lakes seems dirty for me and not beautiful at all especially this Lashi Lake at Lijiang. 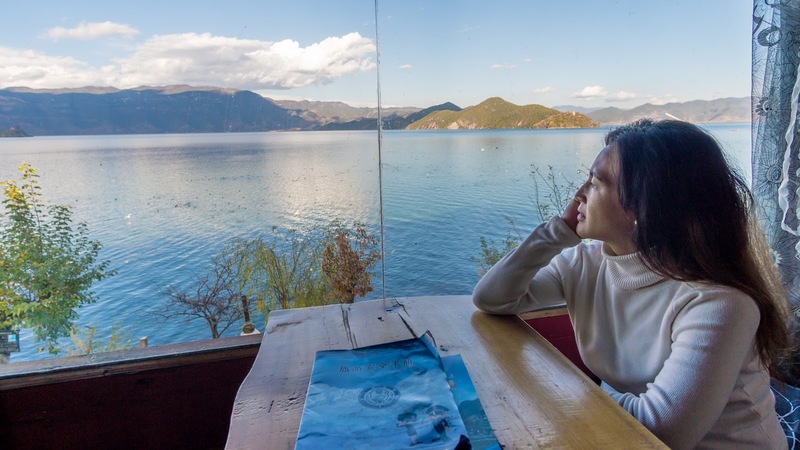 I felt that I was wasting my time and money here as my heart already fall for Lugu Lake. 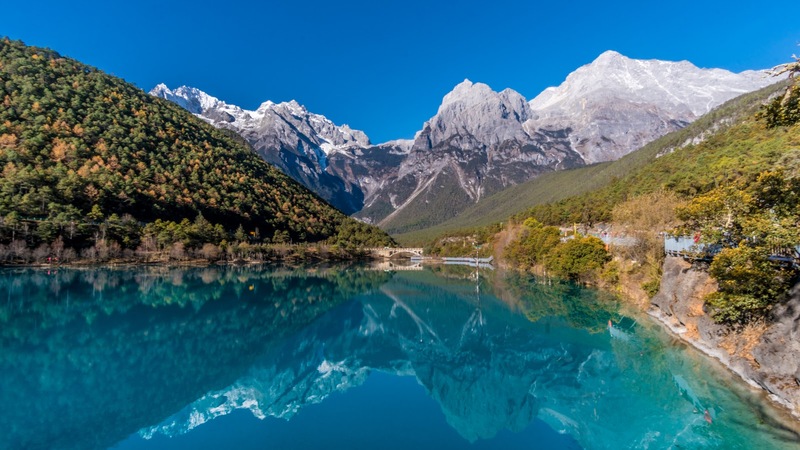 Blue Moon Valley is another breathtaking spot which I believe you should visit it if you are at Lijiang. Jade Dragon Snow Mountain is a famous tourist spot to witness the snow mountain but due to it is overcrowded, I really do not think it is worth it. Especially when the local mainland tourists took their own sweet time taking their photos without even be considerate with the people who are queuing up behind them. Very awful! 8.00am: Took and early bus to Shangri-la. 12.00pm: Reached Shangri-la bus station and spotted a tour agency which provide a decent package to Shika Snow Mountain and Gedan Songzanlin Monastery for only CNY300/pax. No lunch included. 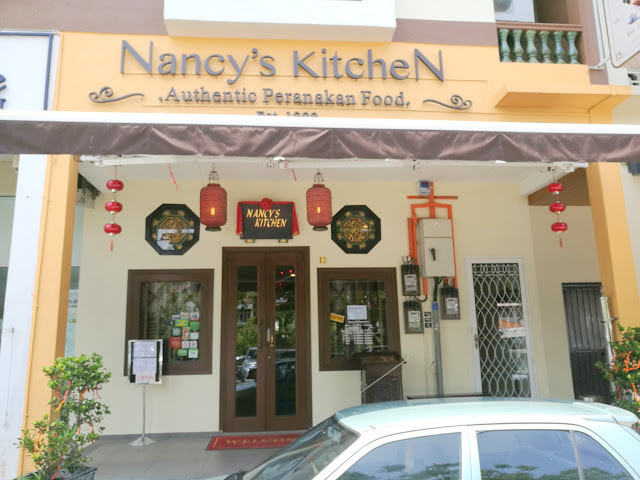 It was like our private tour where they can even service for just the two of us. I do believe the more numbers you have, you can bargain for more. 5.00pm: The chauffeur sent us to a hotel he recommended to us to check in. The hotel is not expensive, it was clean but the problem is not much restaurants at night and not much things to do too. 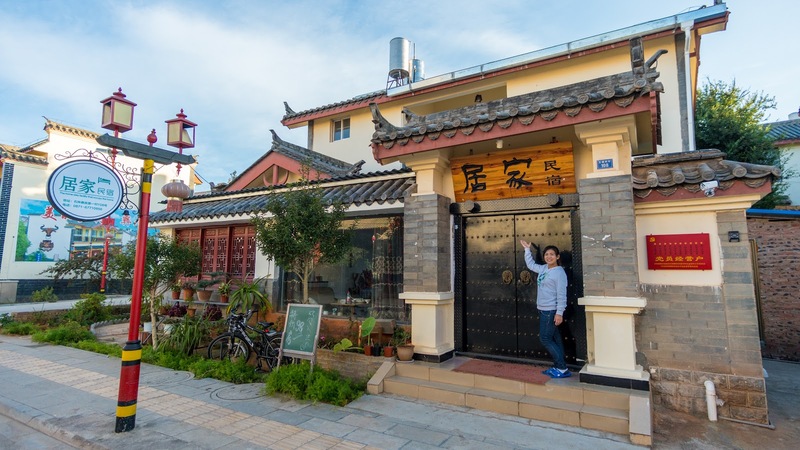 1.00pm: Check in and take a tour inside Dukezong Old Town which is much more smaller than Dali Ancient City. However, it was reaching to the end of our tour. We started to get tired easily and wanted to end the journey already. We have missed our son. The hotel we stayed inside the Dukezong Old Town was the smallest among all the hotel we have stayed. However, it doesn't mean they are not good. It is still very comfortable and rich of Tibetan style. The price is just less than CNY100/night. I couldn't complain much. 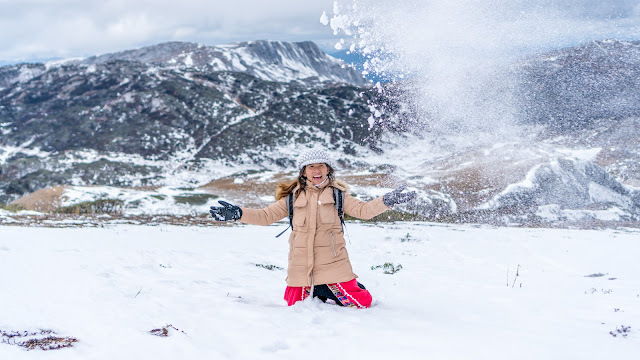 Our real snow mountain experience is definitely at Shika Snow Mountain. We can play the snow and do whatever we want at the mountain. That's the exact way how to enjoy a mountain instead of cramping yourself within the crowd for just a picture but you barely touch the snow. 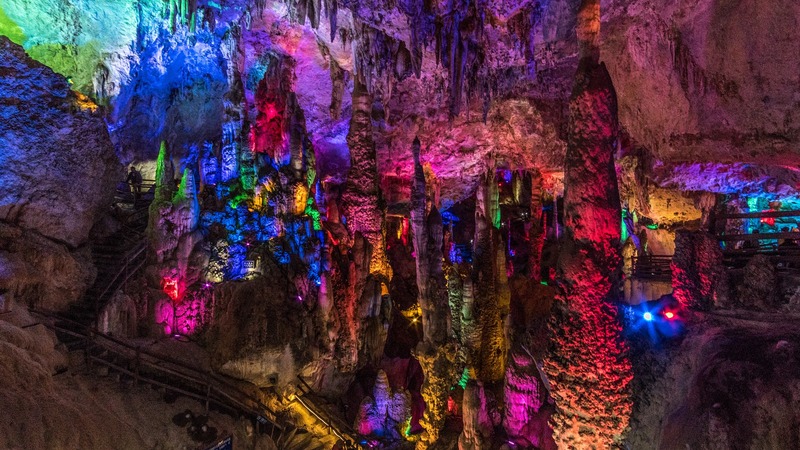 I am trying to relate to Jade Dragon Snow Mountain. The only thing which is not so good is the weather is too cold. Our nose almost fall off but that's how a snow mountain is like. So we can't complain on that. 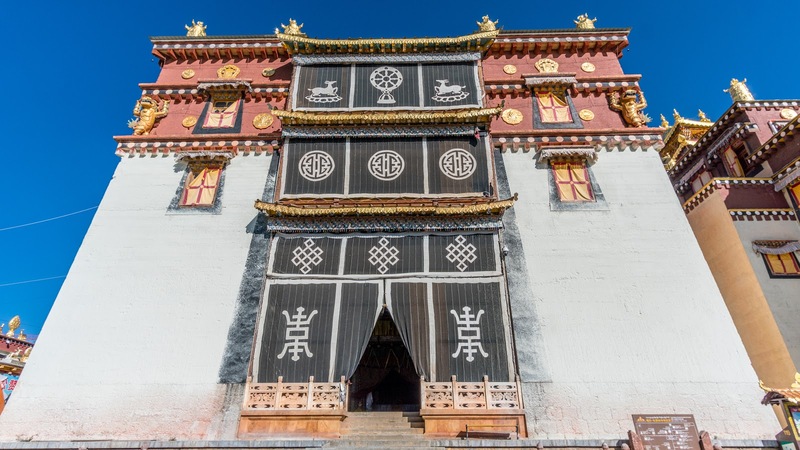 Gedan Songzanlin Monastery is suitable for travelers who prefer to visit a religious site. It is nothing much there especially during the winter. 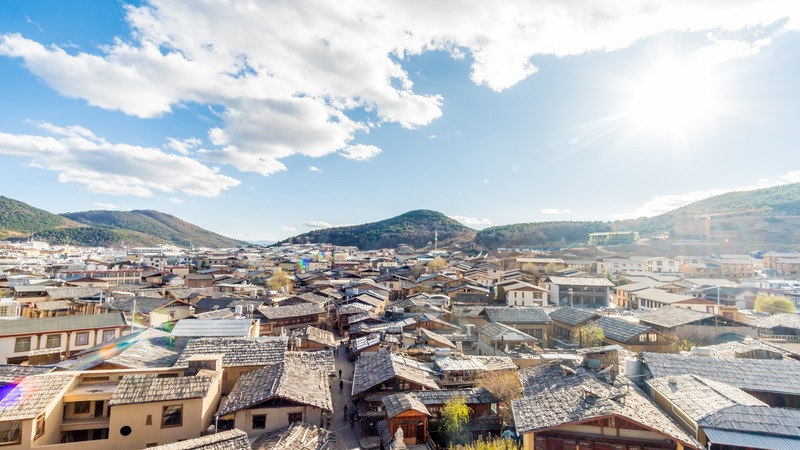 Dukezong Old Town is a Tibetan old town which is smaller than any old town you have visited along the way. The reconstruction is still ongoing after the fire in 1994 which engulfed 1/3 of the town. 9.00am: Start to travel by bus to Lijiang. The bus will pass by Lijiang Airport so we drop of at Lijiang Airport. 3.00pm: We have to take a flight to Xishuangbanna which is most southern city of Yunnan Province. If we take a bus might take days but by flight which is just 1 hour. The cost is not much different too. The flight cost us CNY400/pax. For your information, there is no flight from Shangri-la to Xishuangbanna despite they have an airport. This is what makes the travel slightly not convenient as we have wasted 4 hours on the bus. 9.00am: Visit Xishuangbanna Primitive Forest Park by taxi which cost us CNY25/trip. 10.00am: It is located just 30 minutes from our hotel and the entrance fee cost us CNY65/pax. 3.00pm: Finished tour. From here, you can either fly back to Kunming to back to Malaysia or take an overnight bus. I continue my stay at Jinghong which is my wife's hometown. Xishuangbanna Primitive Forest Park is trying to promote the tropical forest which can be seen in Malaysia. So there is nothing special about the forest park to us. 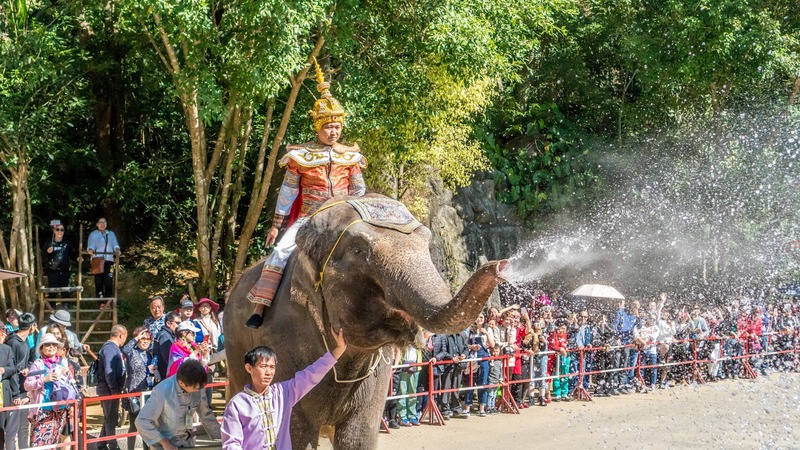 The reason to visit Xishuangbanna is to understand about the Dai Tribe culture which can be largely seen here. Other minor tribes such as Wa tribe, Jinuo Tribe and Hani Tribe. Xishuangbanna city looks similar like in Myanmar. Nothing surprise to that since Dai Tribe is from Myanmar, Tai Tribe. If you are not interested in Xishuangbanna, you can end your trip at Shangri-la by flying back to Kunming. The total cost we have spent for this trip is about CNY7000. We save a lot from the transportation and accommodation in China is not that expensive anyway. As for the food, we chose street food more than restaurants. As for the entrance fee, there are some really too expensive and not worthwhile but we have save a little by signing up with a local tour. 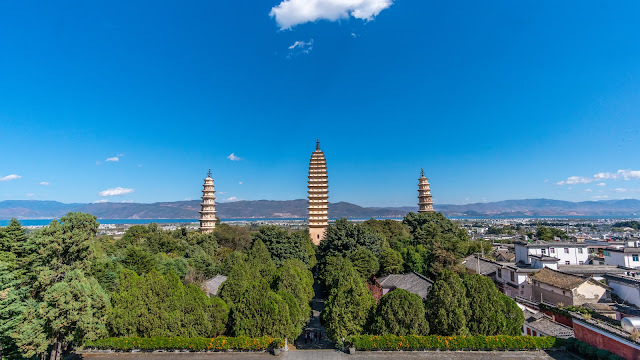 Overall, I would recommend the route which starts from Kunming and ended at Shangri-la. 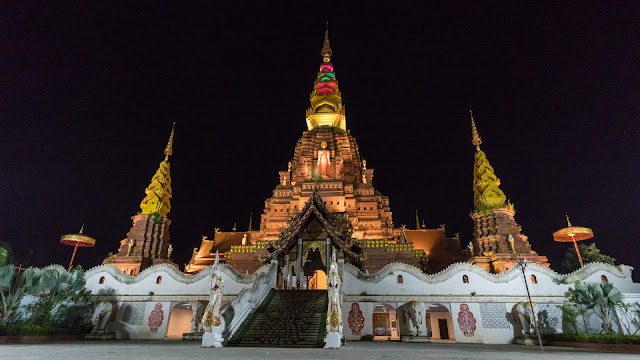 So, you can skip Xishuangbanna which makes it only 16 days trip. Thanks for reading.